From Highway 99 it looks like a black shark’s fin carving the sky far in the distance, high above the tree tops. From Blackcomb Mountain it appears to be a sliver of rock pricking the summit of a local nondescript peak. From the Black Tusk meadows it looks more like a gigantic loaf of blackened bread, and from Mt. Price it stands like a black rotten tooth. No matter the direction though, the Black Tusk’s English name is quickly understood for its aptness. The black stub of volcanic rock protruding from the crumbling grey volcanic cone is indeed very much like a tusk. The native Squamish people had a different interpretation. This was “The Seat of the Thunderbird”, blackened by the mythological creature’s lightning sparks, an image that is also easily conjured in the imagination. The Garibaldi Volcanic Belt was an active region of volcanism from around 1.3 million years ago until the early Holocene Period. During the Pleistocene Period, the region was heavily glaciated and many of the volcanic features formed in a glacial environment. Mt. Garibaldi actually formed on top of an ice sheet; the Barrier formed when a lava flow was dammed by glacial ice; and the Table is a volcanic mountain that formed beneath the ice sheet. The Black Tusk is believed to be the andesite lava that hardened in the conduit of a cinder-rich volcano. Over the millennia, the outer rock has been eroding away, exposing the darker lava plug of the volcano’s neck. 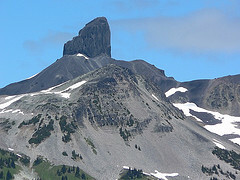 The Black Tusk is one of the best-known mountains in the local mountain ranges and is popular among hikers and artists. Though the rock is friable and loose, there is a route to the summit up through a chimney which is accessible from the Black Tusk Meadows. From the summit one can see twin peaks of The Lions which stand watch over Vancouver. While it is possible to climb the mountain as a day trip from the Garibaldi Lake parking lot, it does make for a very long day. Most prefer to camp at Garibaldi Lake or Taylor Meadows and take a more leisurely time. This was the first mountain I ever climbed. When I was 17 years old, a high school friend and I spent two nights camping at Garibaldi Lake and climbed to the summit of The Tusk on the second day. While climbing the chimney, my friend called down to me and as I looked up I struck my right knee against a sharp piece of lava rock, puncturing the skin in two places. I still bear two faint scars from that incident and I proudly think of them as my Black Tusk scars.